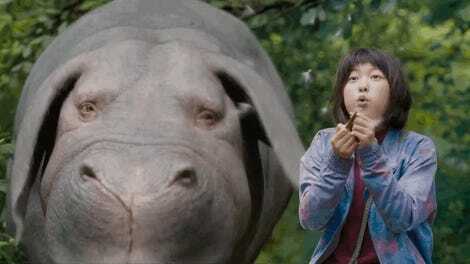 If you’ve seen one of Bong Joon Ho’s movies before—The Host or Snowpiercer, for example—then it shouldn’t be surprising at all to you that Okja is a mix of dead seriousness and bursts of farcical humor. It’s also a movie with a very complicated message, anchored by a tale about a beautiful girl and her monster. And once you see it, you won’t be able to forget it. Okja follows the journey of Mija (An Seo Hyun) and Okja, a giant “super pig,” as the young woman tries to rescue her friend from a mega-corporation. It begins on an idyllic mountain farm in rural South Korea, moves to Seoul for a massive amount of destruction, breaks your heart in a hellish laboratory in New Jersey, and visits a too-slick marketing stunt in New York. Incompetently handled, Okja would simply be a kids movie-turned-screed against eating meat. And while it does a very good job of making the meat industry look so vile that you’ll think twice about ever ordering a McDonald’s burger again, the movie skewers much more than just meat. Okja turns, time and time again, on lies. Lies that are fairly obvious to an outside eye, but that people choose, on some level, to believe. Lucy Mirando (Tilda Swinton) puts a pretty pink gloss on a company with a very checkered past and claims that it’s going all organic and GMO-free. Part of that plan is the “super-pig” project, which sent 26 of its magic, low-impact, high-yield piglets to different places to be given to local farmers. Mirando’s whole schtick is very Whole Foods-y and, from the beginning, you know her claims are too good to be true. But the point is that consumers want to believe her. Lucy employs a beloved TV zoologist named “Dr. Johnny” (Jake Gyllenhaal)—think Jeff Corwin in the middle of a complete nervous breakdown—to put a friendly face on her super-pig project. He’s lying to everyone, all the time, for the sake of his job and his popularity. Mjia’s grandfather (Byun Heebong) lies to Mija about how long they get to keep Okja. He misleads her at a critical point later and, while the audience catches the dissembling for what it is, Mija obviously trusts the man who raised her and is her family, especially when he’s saying what she wants to hear. Mija also crosses paths with an animal rights group which has to confront the things they’re willing to let happen for the sake of their mission. One instance involves a member lying to the group and telling them what they want to hear, while another involves admitting that they knew bad things would result from the plan they’d made. These lies make the characters around Mija very complicated—and it’s enough to make Okja more than just a tale that inspires veganism. While the animal rights group is clearly more in the right than the Mirando Corporation, they’re far from perfect. Both groups are anchored by the actors playing their leaders: Tilda Swinton’s Lucy easily pinballs from a camera-friendly, concerned CEO to somene crippled by self-doubt but obsessed with success, while Paul Dano is luminous as activist Jay, who very earnestly explains his group’s beliefs, completely confident in their ultimate success. As is typical of Bong’s work, Okja swings from pointed, funny satire to big action sequences to heartbreaking emotional moments, sometimes without pausing. This leads to a bit of wanting to laugh and not being sure if it’s okay to do so. The description of Mirando as “fucked” that pops up over and over is a great running gag. There’s a chase through Seoul where Bong shows a masterful understanding of where to put the camera to keep tension and pathos. And every scene in the Mirando factory and laboratories will leave you chilled. But the center of the movie is Mija and Okja. An Seo Hyun does very little talking in this movie; her determination to save Okja is all in her facial expressions and body language. And it’s easy to forget that Okja is a CG creation when they share scenes. 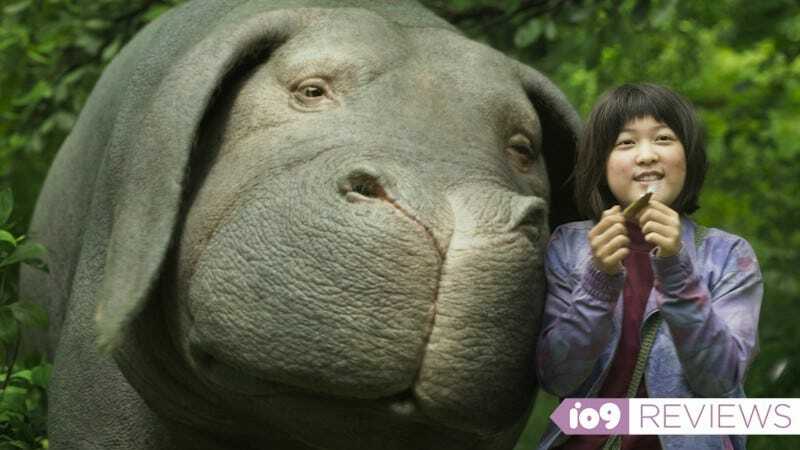 Okja is described as a “super-pig,” but it has the mannerisms of a pet. There were so many moments where I recognized looks my dogs give or movements my cats make. Okja wants you to rethink humans’ relationship to animals, and the VFX of Okja does that work all on its own. These two make all the rest of this movie—as beautifully shot and acted as it is—work. If you didn’t believe Mija’s relationship with Okja, it would all fall apart. There’d be too many characters, too many motivations, and too many locations to keep track of. But Mija’s love for Okja anchors it all. They pull you through the movie, leaving you to think about all the other things Bong addresses later. And ever since I saw Okja, I have not been able to stop thinking about it. Okja is out on Netflix on June 28. Definitely set aside two hours to watch it.